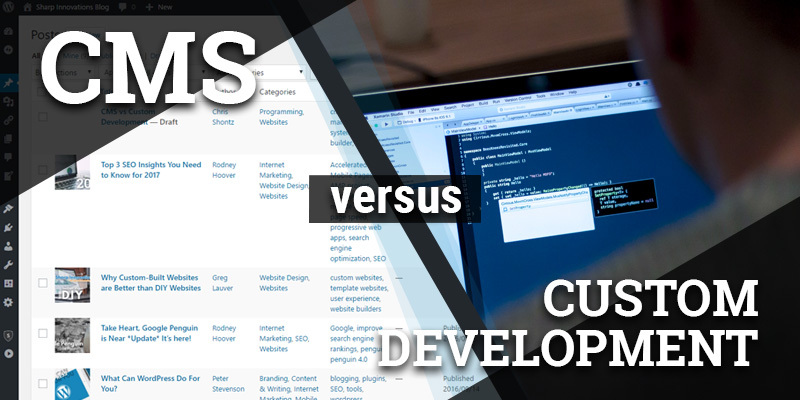 CMS vs Custom Development | Sharp Innovations Blog | Sharp Innovations, Inc. In this day and age, Content Management Systems (CMS) are easier to use and more versatile than ever. WordPress, for instance, started its life as an intuitive blogging platform and evolved into a full-featured framework for robust, database-driven websites. In a lot of circumstances, content management systems decrease development time and help facilitate rapid deployment. However, I can’t emphasize enough that third party content management systems should not be regarded as one-size-fits-all solutions. As website builders, it is our responsibility to ensure that we’re utilizing the correct software solution for the job; lest we create more work for ourselves by altering core functionality, or by adding new functionality that drastically deviates from the content management system’s fundamental purpose. Furthermore, the design team should have intimate knowledge of how the given CMS works and interact closely with the development team to ensure that the design itself doesn’t introduce functionality that is not native to the software. In our experience, this lack of synergy between designers and developers is the number one cause of superfluous custom development that could’ve been avoided. From a development perspective, making extensive modifications to a CMS can be more labor intensive than completely custom development. That is because modifying software requires the developer to reverse engineer the codebase of the content management system, in order to better understand the logic and how to interface with it. I often compare reverse engineering to untangling a balled-up string of holiday lights. First you find an end, and then you feed it through all of the loops and knots until it’s completely unraveled. At which point, you can safely perform your modifications. This is just as tedious and time-consuming as the metaphor suggests. Ground-up development, on the other hand, can be compared to having a suit tailored to fit. Your website is engineered specifically to your needs, from start to finish, without excess material. Furthermore, no reverse engineering is required as we’re creating the components ourselves in a step-by-step process. If your project is pretty standard, with static pages, dated articles, and limited custom functionality, then a third-party content management system such as WordPress would make initial development, deployment, and maintenance quick and easy. If you’re intimately close with your project, if you demand non-standard functionality and frequent complicated changes, and you require granular control over every little detail, then custom development might be more practical and cost-effective in the long run. Ultimately, this is an important decision for your business. That’s why you’ll benefit from discussing it with the experts here at Sharp. So feel free to call us. We’re here to help. Posted in Programming, Websites and tagged cms, content management systems, website builder, wordpress on November 18, 2016 by Chris Shontz.